Do you believe it’s not what you sell, but how you sell that makes the difference? I do. For years, I’ve operated in a very competitive industry with just a handful of providers servicing a limited number of large buyers. Little differentiation existed between me and my competitors. And what differentiation there was I built around our sales process and how we approached and worked with clients. CEB, now Gartner, cited in a buyer study that the sales experience (53%) was the difference. Not the firm or brand name (19%), or price-to-value ratio (9%) or the service capabilities (19%). Think about it. More than half of client loyalty is built on how you sell, not what you sell. One of my competitors often used the FUD factor against us. Of course, you know this as fear, uncertainty, and doubt. Quite frustrating because it weakened budding prospect relationships. Once a competitor infiltrates prospect thinking with FUD, your prospect will wield it against you. FUD works well with people who hate change. Change means risk. Risk could mean loss. If you’re the incumbent, the best way to beat your FUD-driven competitor is to raise the stakes on his game. Help your prospect see change as unsafe. I hated it when competitors FUD-ed us. However, it was effective for them. It forced us to dig deep and work extra hard to land an opportunity. By sticking to our well-structured sales process, we succeeded in defeating the FUD factor often. 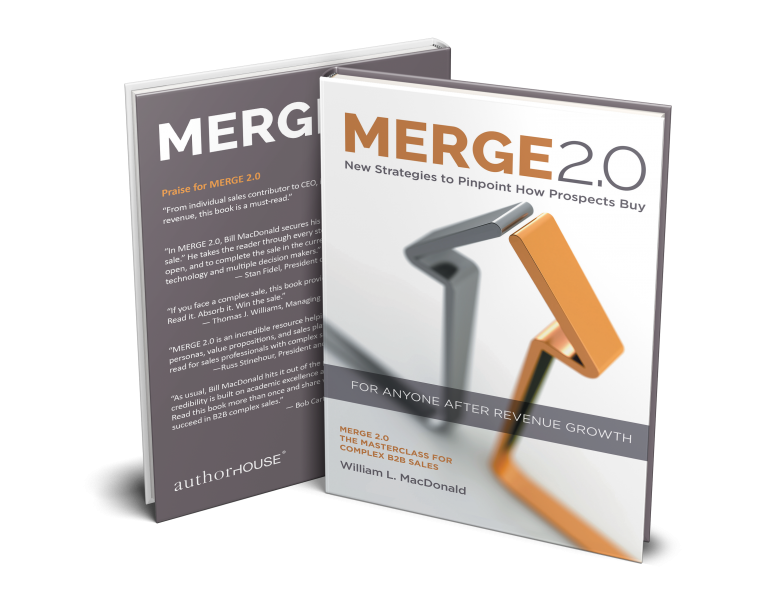 As you learned in my first book MERGE, companies compete on price, product or service. When it comes to price, the incumbent will win every time. All he must do is match the price you propose. No company wants to rip up the sidewalk to replace a vendor solely on price. 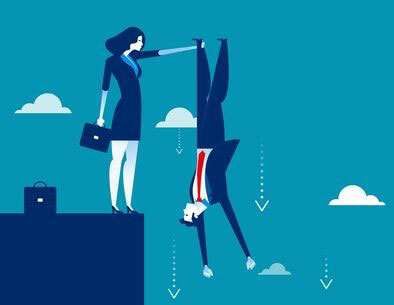 When it comes to products, there isn’t enough differentiation to distinguish one from the other, especially in certain vertical markets like financial services. If you do offer a product with a truly meaningful difference, you need to maximize your leverage. Product differentiation is not sustainable over an extended period. In most cases, the incumbent can match it or come close to matching your difference. You can sell with a new product, but don’t base your marketing and sales strategy solely on that product when attempting to unseat the incumbent. New products play a valuable role only when you’re not selling head-to-head against the incumbent. If you’re offering a new product without a solid track record of performance, the incumbent will use the venerable FUD strategy against you. After all, change is unsafe. It’s a tactic incumbents use to discredit competitors—a clear and strategic attempt to influence perception by disseminating negative, dubious, and sometimes false information. Prospects tend to experience a high degree of FUD when considering whether to do business with a new or emerging company about which they know little or nothing. The more innovative and costly the product or service, and the less well known the company, the higher the degree of FUD in the buyer’s mind. Do the buyer’s homework for him. Research the company’s needs, so you understand buyer issues and challenges even better than he or she does. Gain insights on such topics as the company’s competition, competitive advantage and purchase-decision process before you talk with its representatives. It’s one pillar on the foundation of MERGE─do your homework. Justify product/service costs to buyers. This effort may require a cost-benefit analysis to justify your product or service with the substitution cost of replacing what the buyer currently uses. Encourage project teams. Pull together company employees to participate with you in defining the problem to be solved, clarifying needs, and testing the product or service. This teaming can be critical to helping buyers gain a sense of ownership when adopting a product or service. Stress product/service benefits rather than features; that is, how it helps the buyer, rather than what it does. Show how the product or service meets a buyer’s need or solves a problem, instead of describing how the product or service operates. Provide support. Reinforce a purchase decision with guarantees, warranties, and training. Demonstrate. Offer a realistic demonstration of the product or service to remove any doubts about what it does and what you say it does. The ability to prove a product, visualize a value and illustrate intangibles, catalyzes FUD reduction. Indicate the buyer will fall behind the competition. This strategy requires an understanding of competitor activities, then show how your product or service will enhance the buyer’s competitive position. Prove how the buyer’s operation will be less efficient. This effort requires insight into his distribution, manufacturing, marketing and selling processes, and a demonstration of how your product or service will streamline those processes. Provide data showing that productivity will decline. This move requires explaining how your product or service functions as an employee productivity tool that maximizes the ability to get work done. Wrapped around the FUD factor is the human factor. Ultimately, it is about people who struggle to make progress, solve problems and fix their situation. The smart way to defeat FUD is to fully understand the buyer’s vision for a solution. Know how he or she will personally benefit from your solution. In MERGE 2.0, we refer to this as the prospect’s buying vision. It is not what solution you see; it is what the prospect sees. The prospect’s vision for a solution is inside his head. At the early stages of his buying process, his vision of a solution has nothing to do with your products or services. Prospects buy to make problems go away. They see a discrepancy between where they are and where they want to be. If they think you can eliminate the discrepancy, they’ll think about buying. If not, FUD will kick in and the competition will seize this opportunity with pleasure. Most salespeople I meet hope to help B2B prospects reduce costs, improve profitability, reduce turnover, reduce cycle time, et al. Each result is important as you work to match your products and services to the buyer’s vision for a solution. But truth be told, I lost many a sales opportunity by presenting a better product or solution to meet a prospect’s needs. That was not my prospect’s win. I started winning more opportunities when I applied something I learned many years ago from Miller Heiman: focus on the buyer’s win and the results. This shift pushed me closer to the decision makers, and closer to the reason they wanted to buy. Once I understood the reason, I was able to make it much more difficult for the competition to use the FUD factor on me. Wins and results are distinct yet interrelated. Learn how to understand the linkage because it is a crucial part of sales strategy. Results are the impact that your product or service has on one or more of your prospect’s business processes. Results are objective, tangible, measurable and corporate. That is, they affect many people in an organization at the same time, although they may affect no two people in exactly the same way. Wins are the fulfillment of a promise made to oneself to serve one’s own perceived self-interest. Wins are subjective, intangible, difficult to measure and highly personal. Even when two buyers get the same result, they don’t win in exactly the same way.